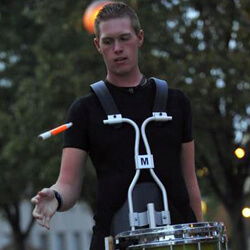 Jesse Backes, 21 University of Illinois Colts 2010, The Cavaliers 2011-2012 Percussion 1. Choose the right group for you. Do not let yourself get caught up in placements. A quality drum corps experience is based on so many things and scores are not (or should not) be one of them. You'll want to find a place that treats the members well at a basic level; they are well fed, get sleep, have a great medical team, etc. Then look at the staff, especially those who would be working with your section. How do they approach teaching? Did past members enjoy working with them and learn lots of valuable information? Avoid getting caught up in a corps' name or reputation. Every group has great years and off years. That is part of the competitive cycle. 50 years after you age out and your marching career is long over, you will not remember the score or the placement. You will remember the people and the experience. Those are the things you should research when trying to find the place for you. Don't be afraid to contact the staff or current and past members with questions or just for conversation. Most people in this activity would love to share their experiences with you and aid you in your decision making process. The drum corps experience is unique and life-changing so you should be confident in which environment you really want your life to change. 2. Maybe the most important tip; Go audition! Once you find your dream group, go audition there! Each year, so many people who really want to march a summer of drum corps sell themselves short, saying things like, "I really want to march, but I'm not good enough yet. I'll wait until next year." The only way you are guaranteed to not march in a drum corps is never going to an audition camp. You may not get a spot the first time you audition. That is okay. I auditioned for the Cavaliers four times before I finally got a spot. Staff members recognize persistence because it is a sign of motivation. It shows that you have the drive and desire to really commit to the group and the activity. That is one of the most important traits of a successful drum corps member. 3. Practice correctly. Now that you've found a group that fits your educational, musical, biological needs, your role changes. You spend countless hours playing the notes in the audition packet, marching around your house, taking lessons, and doing everything you can to prepare. All of this is great as long as you approach it the correct way. When practicing any skill whether playing or marching, make sure you do it with a metronome. Playing perfectly is dependent on your understanding of the music not just your knowledge of it. Memorization isn't the only thing you need. You need to know how the notes on the page relate to your feet and to the metronome. This is a very physical activity, and you have to make sure you are able to march in time while playing each and every note of your show perfectly. That comes from breaking down all of the music. Take rhythms and remove embellishments. For battery percussionists, remove doubles, flams, buzzes, or even one of your hands so you are playing the foundational rhythm. Do so while playing with a metronome and marking time. You can use the same idea in the front ensemble. Play with just one hand, only downbeats, alternating beats, etc. Essentially, know all of the audition exercises inside out so that you are prepared for any variation and are confident in your ability to play them correctly with your feet moving in time. 4. Do not cut yourself. As soon as you step through the door at the audition site your practice time is done and now you are in the "Here's me, check out what I've got" mindset. Yes, you want to go in ready to learn tons of new information and new methods of playing and learning, but you don't control that. You cannot control what the staff thinks or how other people play. You can, however, control yourself. You can perform as best you can and that is the end of it. Try as hard as you can to keep this as your focus. As soon as you start to doubt your preparation and your abilities because you see some guy who you recognize from YouTube, that's when you start to make mistakes and you start to panic thinking about getting cut from the corps. Keep playing with as relaxed a mindset as possible and don't let these feelings convince you that you are cut before the staff says anything. There are only two ways to be guaranteed to get cut; not showing up at all, and the staff cutting you. You can only control yourself and the staff will evaluate what you do throughout the camp, so don't cut yourself before the end! 5. Hang chops. To be in a drum corps percussion section or horn line, you need to have musical chops and marching chops. We know this as students and as musicians. However, there is another huge part of the audition process that is just as important if not more important. Hang chops. Your ability to meet and talk to people is incredibly important because, should you get a spot, you will be spending three solid months with those people around you. You want to be with people you like, so make sure you are talking to the veteran corps members and the other prospective members and get to know them! There will be tons of meals and breaks to take advantage of, the worst outcome being a few new friends and contacts you'll meet who love doing what you do. View additional audition tips, and learn more about corps audition dates, locations, and more.